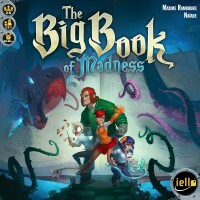 The BIG BOOK of MADNESS is a very cleverly devised game from French game designer Maxime Rambourg. It is graced by some rather elegant illustrations by Xavier Durin, known in the board gaming world as Naïade. I was quite disappointed at Essen a year ago when IELLO showed me the Big Book of Madness, explained how it played, and then told me it was only available in German, so this year at Spiel I was very excited to see that it had been published in English and even more happy when I obtained a copy to play and play and play and, well play, and then review, and then play again. The players are students of magic who have found an impressive tome. On opening it, accidentally of course, they discover it is actually a prison for a whole bunch of monsters that if released could easily cause Lovecraft-style madness to spread amongst the populace. Each player either selects or is randomly given a Hero/Heroine card (Magician Sheet) that has a Player Aid on its reverse side – there are 8 of these to choose from and thus there are enough Player Aids for all players to share – and 4 White Bordered spells (these are specifically for the players:- Growth, Combustion, Telepathy and Ice), all other spells are black bordered and collected during play. The Grimoire, the aforementioned impressive tome, has to be set up for each game. There is one final page which is used for every game and then 12 Interior and 4 Cover pages from which the 5 book pages and 1 cover are randomly determined and placed on the right half side of the Lectern (the book at top middle of the board); this is how the Grimoire for each game is set up. Each page has Curse/Element icons on it from the four main elements, Fire, Earth, Water and Air, showing the three which will be required to defeat the next monster; you keep defeating monsters until you get to the last page and have to defeat the final foe. There are four phases to each player’s turn and depending on the number of players it is possible that some players will have an extra turn; there are six Rounds in the game and a Round ends when the players have defeated the current monster. It is also possible that not all players will end the game as they could go mad during play. Characters go insane when their players pick up too many Madness cards and end up with a compliment of Madness cards in their hand and no element cards. Every Spell has a cost to cast it and that cost can be multiplied but the spell can only be cast once per player’s turn. So for example Combustion costs 1 Red (Fire) element card and destroys a card in your hand, thus you could destroy a Madness card or you could spend more than 1 Fire Element card and destroy equal to that number of cards in your hand. Once you cast the spell you turn the Spell card sideways (like “tapping” in MtG) and you can only turn it back at the beginning of your next turn. Your character card has a special ability, the details of your starting Element cards and three slots where you can put Support cards; each special ability is different so it makes sense to plan amongst you prior to starting and decide who will play which character, this is perfectly legal as long as you don’t set up the Grimoire, look through it, and then decide on characters. Role players should look at the Grimoire and its Curses as the GamesMaster and the monsters as encounters on the way to the final end game villain. Players can have many cards in their deck but can only hold 6 cards in their hand at the end of their turn. If they have more than 6 they have to discard cards down to 6 and if they have less they have to make their hand up to 6. If they do not have enough cards in the deck to make their hands up they have to take Madness cards which are then shuffled into their discard pile and a hand of 6 dealt. If you ever end your turn, after making it back to 6 cards, holding 6 Madness cards you are knocked out of the game. If all players are knocked out the Grimoire wins. Players can always converse with each other and offer advice. They cannot actually swap cards but they can play Support cards onto their character and these can be used by any player on their turn (but obviously only used once and then discarded) as if they were part of that player’s hand. The Monster phase is where the characters suffer the effects of the Curses. The Invocation board is numbered 2-5 and Curses are dealt onto these (2 Curses on the 3rd space) at the start of each new Monster. The players have a turn each to destroy whatever Curses they can by using the cards in their hands and in Support to equal the necessary Elements to defeat the Curse (as shown on the Curse card). If they fail to defeat the first one in the line then when the Monster phase begins all players suffer the consequences. Curses do not have to be defeated in the order they appear but for each one that isn’t defeated as it is reached the characters suffer. Sometimes, even with Support, the players cannot defeat a Curse on their turn, in which case they should do all they can to help the other players, if there is no collaboration then there is no victory. This is actually one of those good cooperation games where all players win or all players lose; there is no separate winner who has more points than the others. The players keep their known spells face up in front of them to help the other players see what is available and to assist each other with suggestions of what to do based on the spells available. Players can usually have only 5 spells, beginning with four and gaining another, but one character has the ability to hold six spells. When you spend Element cards to activate the spells you get no change, so using a 2 or 3 to activate a spell needing just one element can be expensive and oft destructive for the group. At first with the Curses being quite easy to defeat it seems like the players will walk it but as they advance through the book the Curses get stronger and need more complicated sets of Elements to defeat them. Then, of course, the players have been adding Madness cards to their decks and so drawing Element cards into your hand becomes a lot tougher and the game takes on a new look. Once you have mastered the way to play there are a couple of modes that you can introduce to make it even harder to succeed. These do not change the rules or the way the game is played, they just make it tougher for the players to succeed by adding Madness cards to their hands from the beginning or changing the make up of the player’s Start cards (as shown on their character sheet). The Round track has three columns, one for each level of difficulty, Easy, Medium or Hard, and the level should be chosen before the game begins as it determines the number of Curses for each Monster and which Invocation section they are located. Nearly every game we have played as gone down to the wire on the last Monster. We have either been fortunate to have just the right number of Elements or we have fallen short at the last hurdle. It is always a game of discussion and decision. I actually like this a lot and am as excited to play it now as I was to see it in English but even I have to admit that it is not a game to play too regularly, not daily or even weekly. it is best played then laid aside for a while and brought out when you have new players round or you are having a weekend gaming session and need an easy to play and explain game with enough substance to occupy the minds of core board-gamers and enough novelty to encourage new players to involve themselves in the cooperative aspect. Add a Review for "Big Book of Madness"